The beginning of a new school year can be exciting, but for some families it can also be a stressful, expensive time of year. Absorbing the yearly cost of new school supplies, like back-to-school clothes, is challenging for some and impossible for others. That was when she reached out for help. “It all started off as a mental crisis,” she recounts. 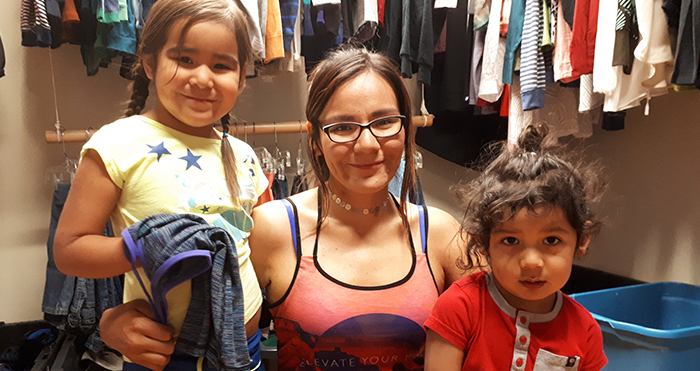 “I thought, I need support so I don’t feel so alone.” Corenda found Bissell Centre by searching online for affordable daycare, and discovered our free child care program. With access to child care, formula and diapers, and clothes from the Family Closet, Corenda has also found an affordable home for her family and returned to university to finish her Bachelor’s degree. She and her kids now give back to those in need whenever they’re able. In fact, they frequently donate their gently used items back to the Family Closet. Donate today to help more families like Corenda’s!